What is Calvinism According to Soteriology101? 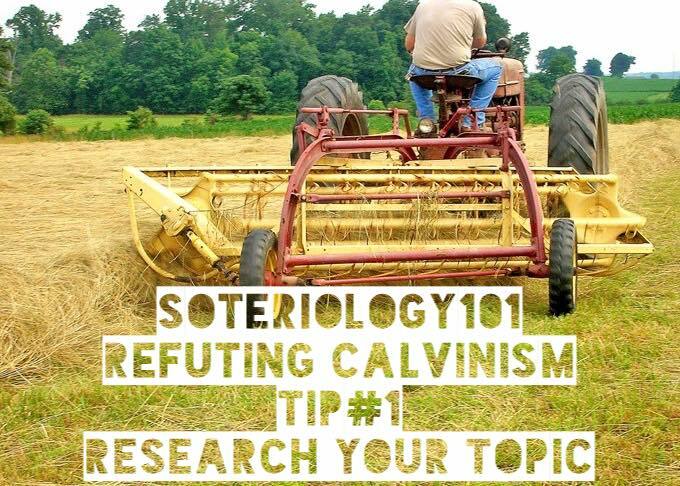 This is a video that is put out by the folks at Soteriology101 and is ostensibly supposed to be a video presenting what Calvinism *IS. * I recommend you watch it first. Go ahead. It's only about 4 minutes long. We will wait. Ok. Are you back? Moving on. I think this video follows the clear and well evidenced fact that Soteriology101, on its anti-Calvinistic campaign to expunge Calvinism from the church, is willing to misrepresent its opponent and mislead their audience. For those of you who have followed my interactions with Flowers, and the interactions of others like James White, Sean Cole, Jason Mullet, and dozens and dozens of others, you will know for a fact that Flowers has been often and repeatedly corrected on his understanding of Calvinism. It does not mean that he needs to AGREE with it, think it is Biblically faithful, is coherent, or anything of the sort. He can reject it with every breath he breathes if so wishes. But in the name of Christian charity, honesty, and integrity he has an obligation to accurately represent it. This video shows, once again, that he has zero ability or interest in doing so. 1. The video is supposed to be representing what Calvinism is. Not what the people at Soteriology101 wants it to be, or what they think it *really* entails, but what it is. But what they do instead, is replace what Calvinism is, as a Calvinist would affirm it, using our terms and concepts, and replaces it with their caricature of it. This kind of not so subtle misrepresentation by alteration is not a charitable way to engage with opposing views. We will see how this maneuver, to not use Calvinistic/Reformed concepts to understand Calvinism, will crop up in my others. 2. Almost immediately, they decide to alter the system for us. The T in TULIP is for Total Depravity. It is *not* for Total Inability. While Total Inability is a logical consequence of Total Depravity, they are not identical doctrines. The reason why Total Depravity grounds Calvinistic doctrine is because it sets a certain theological framework under which the other doctrines are to be understood (Total Inability included). To simply dismiss the conceptual framework of a belief system (either because you don’t like it, think it’s irrelevant, or misunderstand and think it’s the same as the other doctrine) is either done in ignorance or intentionally. To try and understand Calvinism apart from the concept of Total Depravity is like trying to understand Roman Catholicism without understanding the Magisterium which colors every aspect of it. So for the video to simply dismiss the foundational context and replace it with a subsidiary entailment is going to misconstrue the rest of what was said. In fact, even most non-Calvinists of the Roman Catholic and the Arminian stripe recognize this and overcome it with concepts like Baptismal Regeneration (Rome) or Prevenient Grace (Arminianism) where we are Totally Depraved and it does take a miraculous grace imparting work of God to overcome it. The question is just what is that miraculous grace imparting work, who does it happen to and when. But to gloss over that entire concept and context and to skip 100 miles downstream and ignore it, is very uncharitable and misleading. 3. The other problem will arise when the non-Calvinists from Sot101 will say things like, “well what is FACTUALLY incorrect? Doesn’t the unbeliever not WANT God? !” and so forth. They will push that the unbeliever doesn’t *want* God and since that is “all the video says,” surely it is accurate right? This is Flowers’ and co.’s typical response to comments like this. So are they accurate? Well not exactly. There is a way to be misleading and incorrect while stating something that is semantically true, based on conceptual equivocations, slanted or omitted context or contextualizing concepts, and misplaced frameworks or assumptions that lead to implications that one would not otherwise take had they had all the information. Here is the issue is that this is a kind of conceptual poisoning of the well. To cast the tension in terms of subjective “wants” of the individual, just is to make the typical conflation of categorical and conditional abilities and to present it in a way that is slanted by a Libertarian assumption that the person would potentially “want” something different, if the big bully concept of God didn’t keep them from wanting it or forcing them to not want it. It trades on the assumption of a LFW concept of autonomous desires that simply are not a part of Reformed theology. As such it is a subtle (yet substantive) misdirection by slight of hand. On a Reformed concept, God does not intervene or directly cause us to want things that we would otherwise not want for example. So the entire first half, that is ostensibly telling his audience what Calvinism *is* BEFORE he goes into the critiques of the 2nd half, isnt ACTUALLY telling us what Calvinism *is*. Rather, what we get is a kind of misdirection by failed internal critique. An internal critique is only valid when it is accurate to the concepts and frameworks of the views it is critiquing without bringing in assumptions that are not part of the position it is critiquing. Here, Sot101 presents Calvinism via “summary” but the summary is slanted by the introduction of assumptions that are not inherent to Calvinism. So the entire summary of it is wildly misleading and poisons the well to help sell the later criticisms to his audience that already agrees with him. 4. There are numerous problems with the criticism section but I will state my biggest one – and it is one that Flowers has been corrected on dozens and dozens and dozens (likely 100+) times by pretty much every Calvinist who has ever engaged with him. And that is that he simply ignores the role that PROVIDENCE plays in Calvinism. There is a great irony in the way that anti-Calvinists and hyper-Calvinists are actually kissing cousins to each other. They BOTH agree that there is a dichotomy between LFW and hard determinism and that LFW is the ONLY valid concept of freedom and that hard determinism (sic fatalism) is the ONLY valid concept of determinism. They just disagree on which one is false. What this does however, is it makes it impossible to reason with either of them because they cannot fathom concepts outside of that false dichotomy and they both will collapse determinism and the decrees of God into the outworking of the decrees in their singular instances, and completely ignore that God ordains the ends AND the means, and that one of those means will be the free choice of persons to do what they desire to do. Because they both can only think of LFW as freedom, they thus only have a categorical concept of freedom and responsibility and thus for them both, to deny categorical ability as viewed in LFW just is to reject the ONLY valid notion of freewill. And so since they make this assumption based on the false dichotomy, they think it is a valid critique to accuse Calvinism of fatalistic hard determinism. It’s why you get accusations of the Calvinistic notion of God being the “author of sin” (whatever that even means) or the charge that Calvinists have no reason to evangelize or prayer (because they see no point in means and think the decree comes about directly, immediately, and as a primary cause with no conditional free choices). So not only is the “summary” a caricature of Calvinism based on the implicit subversive assumption of Libertarian concepts of wants, but then the criticisms that follow are criticisms of hyper-Calvinism AS IF it was historic, or even neo-Calvinism. So it misses with both the left and the right hook as it advances a polemical propaganda assault on it's enemy. For more of my content of Reformed Theology, see HERE.